The women’s training centre, sponsored by the Centre for Women’s Development and Rehabilitation (CWDR) has completed its second year of training, and a function to mark the event and distribute certificates was held in Kilinochchi Wednesday, sources in the Vanni said. 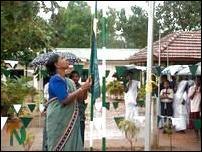 Ms. Thamilni, Head of the women's political wing of the LTTE, hoisting the Tamil Eelam national flag. The function started at 2:00 p.m. with the lighting of ceremonial lamp by the Deputy Director of Health Services for the North-East, Dr. Sathyamoorthy, and the Zonal director of education in Kilinochchi, Mr. Ariyaratnam. 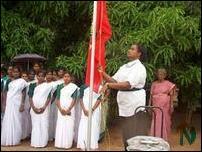 Ms. Thamilini, the political head of the women’s wing of the Liberation Tigers, hoisted the Tamil Eelam national flag. The coordinators of the CWDR training project, Mrs. Kamalambal, and Ms. Rohini hoisted the CWDR flag and the college flag respectively. The mother of the martyr Capt. Thulasiram lit the sacrificial flame to honor all martyrs who gave their lives for the freedom of the people, and garlanded their pictures. Following the prayer session, the Karaichi divisional secretary, Mr. Pon Nithiyanandan, declared open the function by cutting the ribbon. The students of the training centre conducted an exhibition of textile products, decorative cake products and flowers, dolls, etc. for the guests. 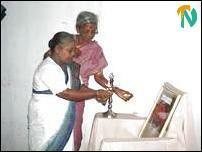 The head of the CWDR, Mrs. Somasundarampillai, presided over the function. The principal of the training centre, Ms. Rohini, delivered the welcome address. Rev. Devasakayam delivered his blessings. The Deputy commissioner of the Karaichi division gave the congratulatory address. 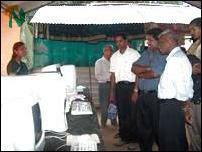 Dr. Sathyamoorthy and Messrs. Ariyaratnam and Pon. 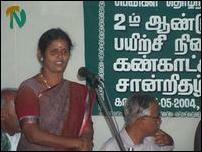 Nithiyanandan, and Mrs. Kamalambal spoke. Speaking as special guest, Ms. Thamilini said that such training for women should continue and that those who completed the training should look for self-employment using their entrepreneurial talent instead of trying to hunt for traditional employment. “Using our natural resources, you could attempt to create small industries. This centre also provides training in electronics and woodwork. 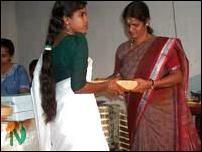 Women should utilizes such opportunities and strengthen themselves,” Ms. Thamilini told the graduating class. Prizes and Certificates were distributed to students who distinguished themselves during the training.